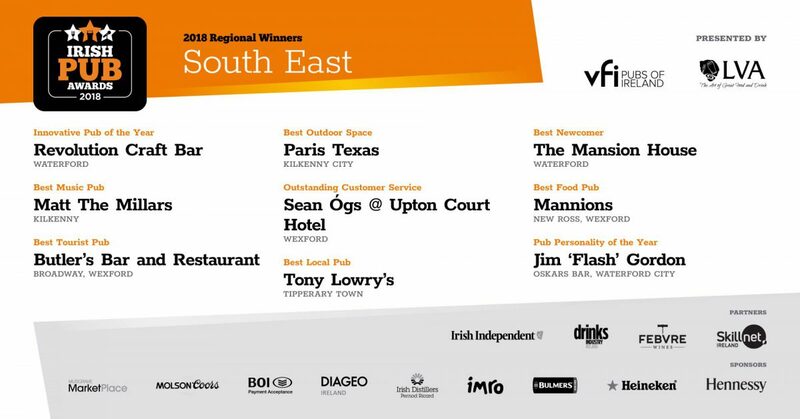 Some of the finest pubs in the South East representing Counties Waterford, Wexford, Kilkenny and Tipperary are celebrating following their success at the 2018 Irish Pub Awards Regional Finals, which took place in Rafter Dempsey’s Pub, 4 Friary Street Gardens, Kilkenny yesterday evening (26th September 2018). All nine winners will now go forward to the final of the National Pub Awards at the RDS Concert Hall in Dublin 4 on Wednesday 21st November when the National Category Winners and the overall Irish Pub of the Year will be announced. 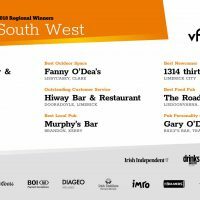 “The Awards were developed as part of our strategy to raise the profile of VFI member pubs around the country. The Irish Pub is at the heart of every town and village and it is where locals gather to meet friends and neighbours for good food and craic. It is where tourists meet locals and can enjoy Irish hospitality at its best. Irish Pubs are also a major provider of employment in our regions. These Awards are an excellent vehicle to showcase what the pub has to offer the modern customer”.